Forehand lasso/reverse finish of Rafael Nadal (*1986 / ESP) is not always exactly what many think that it might be. 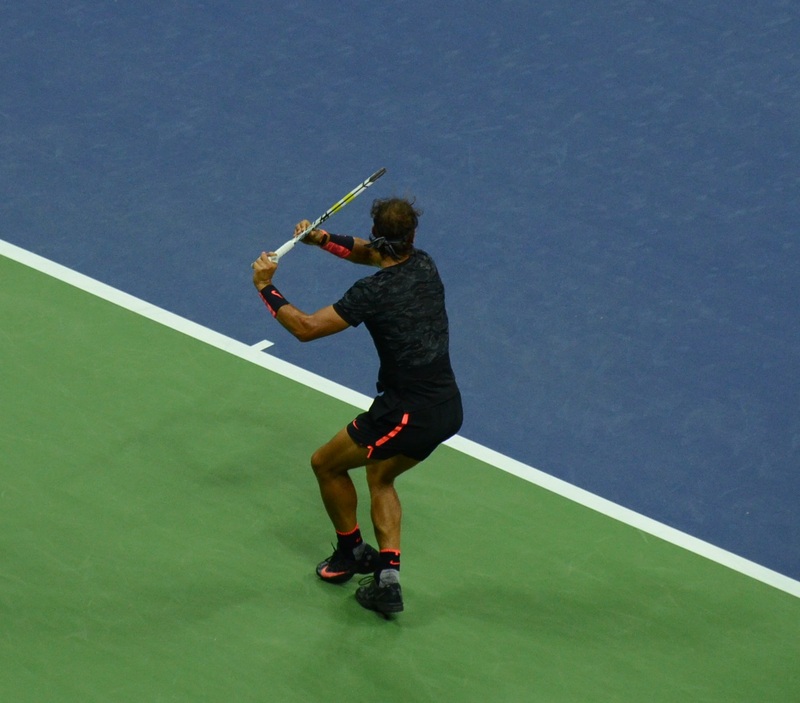 Surely, Nadal as many other players (notably Sampras, Sharapova) goes with his racket very fast and steep up and later back when he is hitting an emergency forehand with limited time/space availability (close to the body). 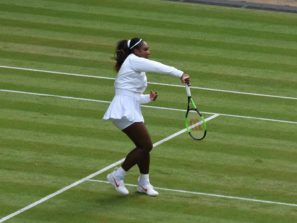 But he tends to go for the lasso/reverse finish (sometimes also called buggy whip) also on other mainly very powerful strokes (like shown below) when he hits the ball in a comfortable distance from the body and with a long follow through against the target. Photo 3/ shows the end of the active phase of a very powerful forehand topspin with a full-body engagement, the ball is already gone. Only later – photo 4/, the lasso/reverse finish occurs. 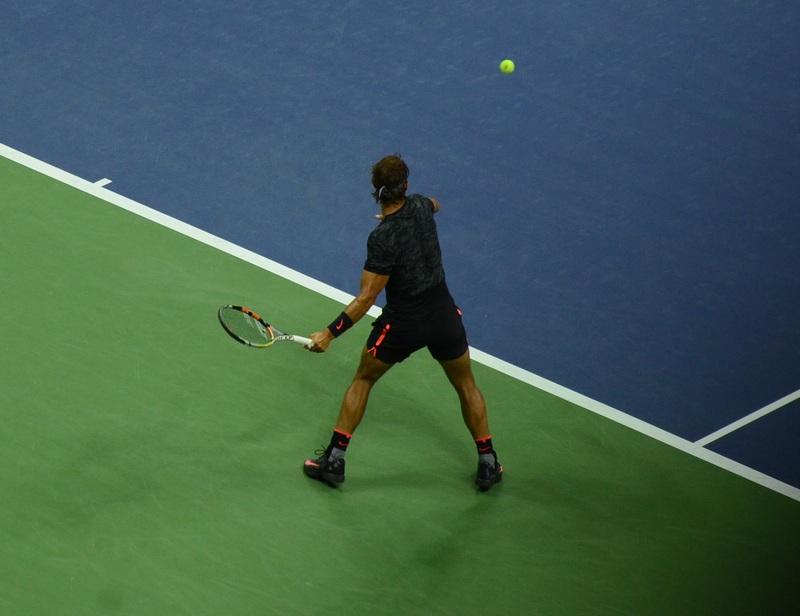 This action has no effect on the ball whatsoever, it’s just a release of the enormous striking energy, which Nadal produced and his personal idiosyncrasy, which he has developed over the years. The active striking action having a real effect on the ball can be then well seen on the photos 1/-3/ as well as 5/-7/ below. Following Nadal since his junior years, I was able to observe quite a significant development in his technique. In his early years, he had the tendency to hit the balls a bit closer to the body (sometimes quite close and late) and with quite an extreme topspin (to a high degree based on the arm action), this is where his lasso/reverse finish does originate in my opinion. 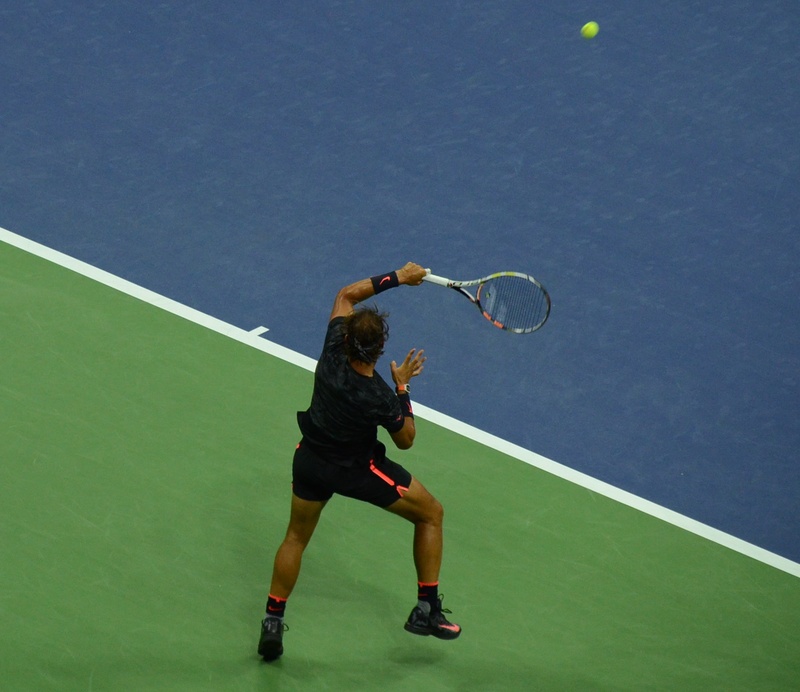 Nadal has then over the years significantly improved his technique (from Tennis 2.0 towards TENNIS 3.0) in all of the strokes leading to more efficiency and making him to the dominant #1 in the world. On the forehand side, he learned mainly to hit/impact the ball further away from the body and to go more through the ball against the target. His forehand follow through became longer and the elbow is going much further away from the body these days than years back. These are all typical TENNIS 3.0 parameters. The lasso/reverse finish remained as an idiosyncrasy even on the strokes where it would be to not needed for time/space reasons. Most probably this finish is also one, which gives Nadal confidence, being part of his belief system. 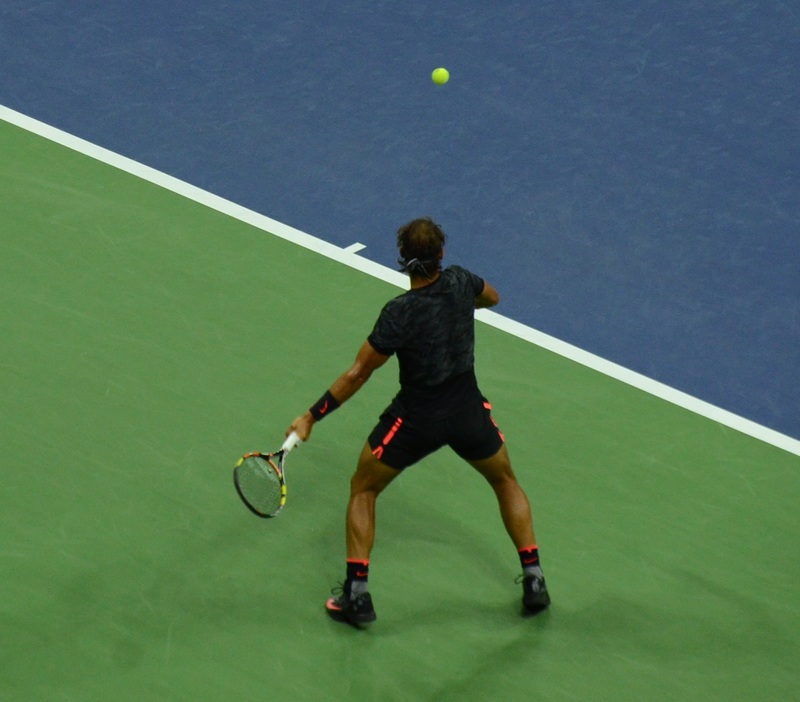 But it is also a sign, that Nadal does not always use the energy developed for the strokes with the best possible efficiency as there is still a lot of energy after the impact available in his system. This might then be one of the reasons for his quite frequent injuries and a rather early decline. In my personal opinion, reverse/lasso finish is a stroke variety, which every player should have in his/her repertoire, but it should not be the standard for every forehand stroke. The “up and across” as well as “down and across” finishes seem to be more efficient and also more body friendly. And for all 3 mentioned then goes, first the proper use of the TENNIS 3.0 CODE, taking care of optimal circumstances in the time of the impact, makes them to reliable weapons.